available for all versions of these millers. Clausing vertical and horizontal Millers were manufactured by the Johansson Company, a firm that Atlas/Clausing eventually bought out. 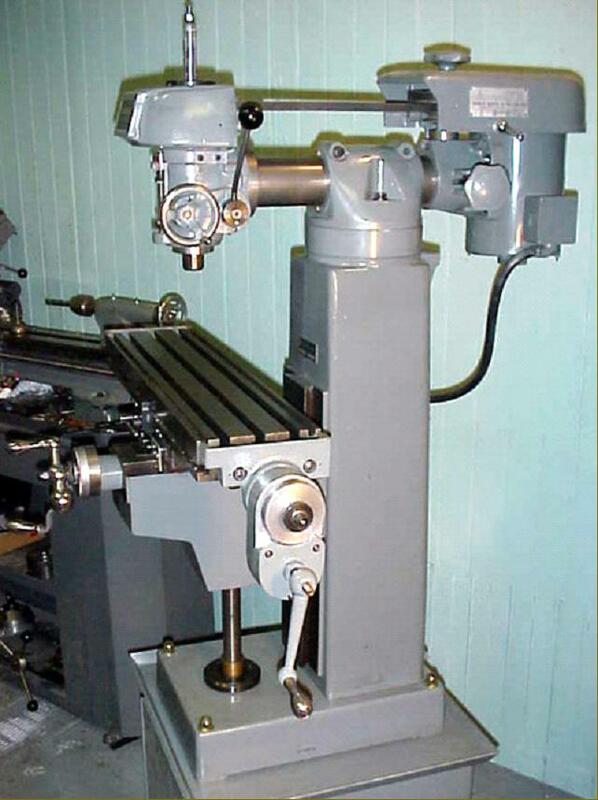 The vertical machine was built in two models, the original 8520 and 8525 (that differed only in their quill fittings) and the later and improved 8530; the horizontal miller was designated as the 8540, 8541, 8550 and 8551, again with only relatively minor details (the type of electric motor or the provision of hand or power table feeds) to distinguish between them. 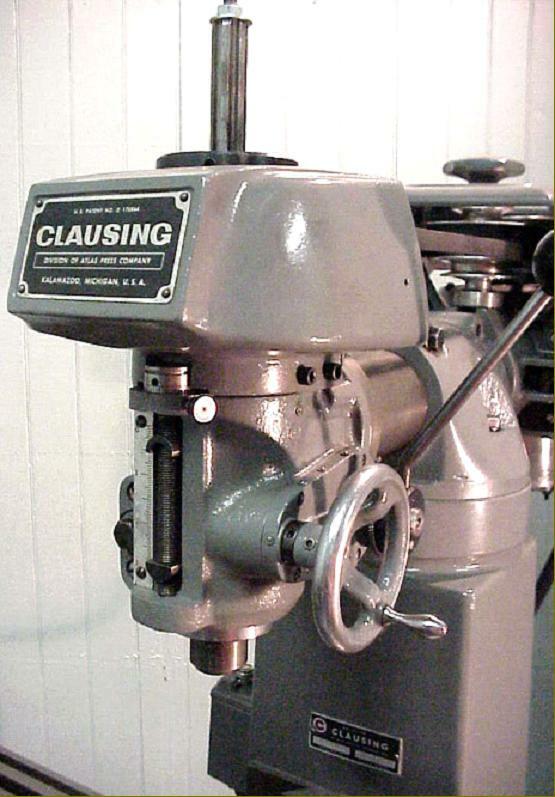 A sought-after machine in its home country - and with good reason - the Clausing was a compact, strongly-built machine that could be driven by either a single or three-phase 1725 rpm 60 cycle rear-mounted motor that provided (through an all-V-belt drive system with an intermediate jockey pulley) a range of useful spindle speeds: 180, 350, 600, 1000, 1900 and 3250 rpm. To slow the spindle from higher r.p.m. a hand-operated brake was provided.. 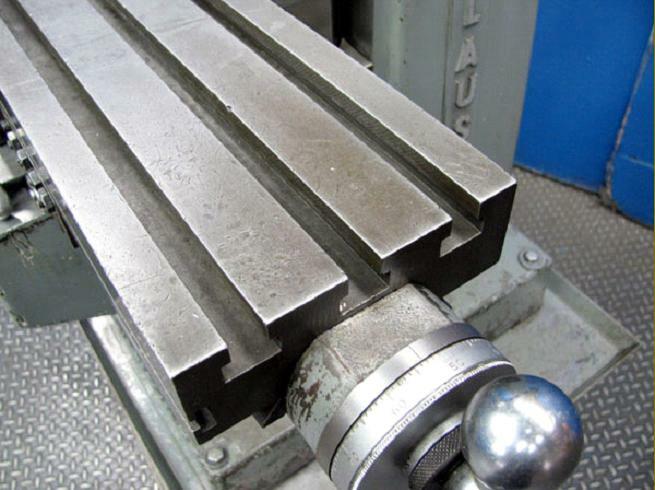 The hardened, chrome-nickel steel spindle could be ordered with either a No. 2 Morse (Model 8520) or a No. 7 Brown and Sharpe taper (Model 8525) - both perhaps a little undersize for heavier work - while the hard-chrome plated quill, with a micrometer adjustable stop, had 3" of travel by either a (useful and clever) two-speed, quick-feed lever - or a handwheel. Each quill was individually fitted at the production stage, with the housing being honed to fit. 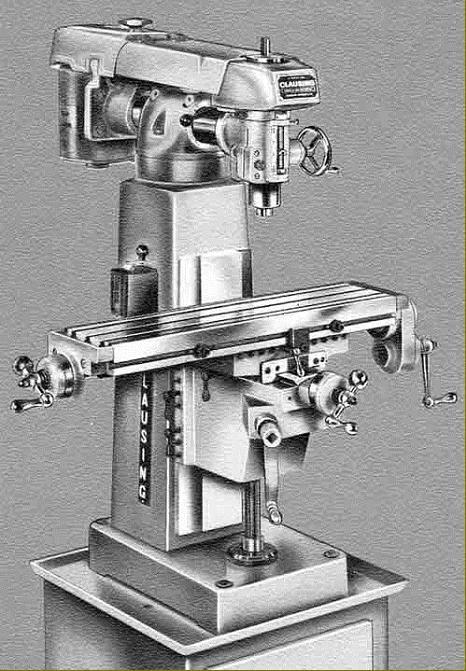 Not only could the head carrying the spindle be rotated in a vertical plane but the whole of the turret head also rotated horizontally - allowing great versatility in setting jobs and machining otherwise difficult angles. 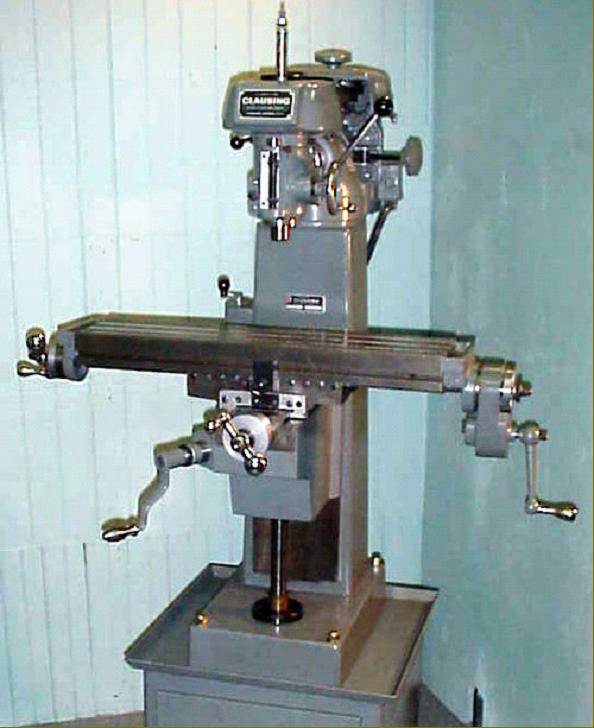 The 24" x 6" table, with 15" of longitudinal and 5" of cross movement, carried three T slots, had handles at both ends and large, clearly engraved micrometer dials. 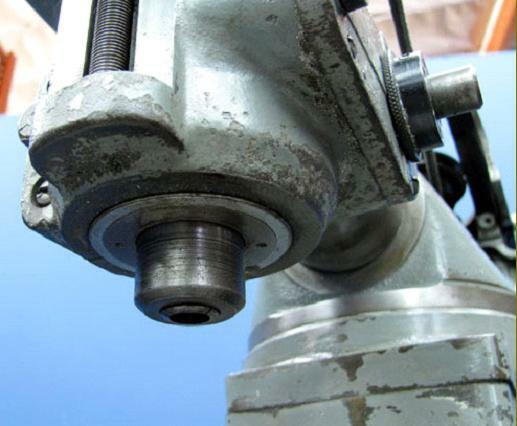 The table feed screws were of high quality, having ground threads and supported in ball bearings where they passed through the table-end brackets; options available for the table feed were an hydraulic drive for production work and (though possibly only on the later 8530 model) a hand-operated fast table feed. 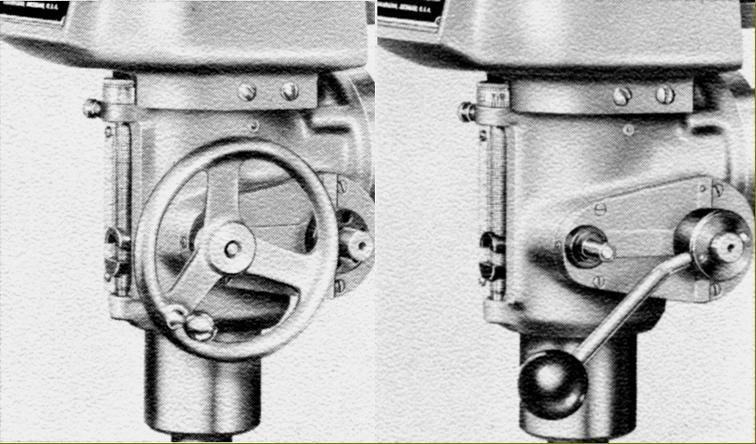 The latter unit consisted of a gearbox casing hung from the end of the table with a handwheel permanently attached to the lower shaft that connected directly to the reduction gearing. 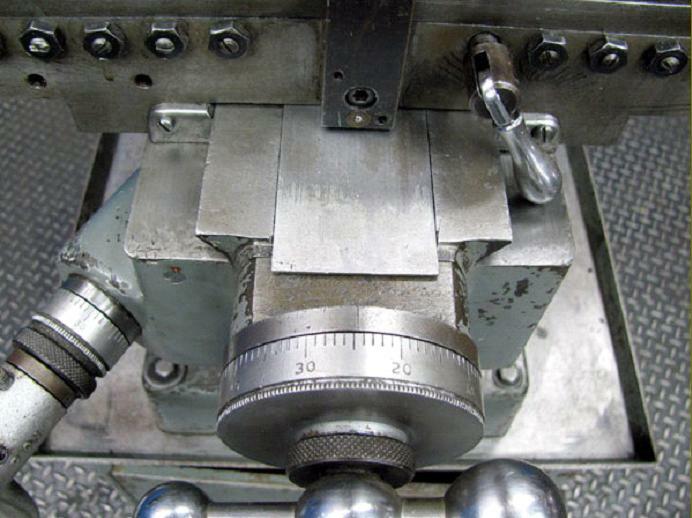 With the handle pushed in the feed screw was driven at a 1:1 ratio but when pulled out a "high-speed" 4 : 1 drive was engaged - where one turn of the handle rotated the feed screw through 4 turns to re-position the table very much more quickly. On the Model 8530 the option was offered of an electronically controlled power feed unit; this could be provided in two forms, to move the table just longitudinally, or in traverse as well - though unfortunately both versions earned a reputation for unreliability. For the size of miller the number and closeness of the gib-strip adjustment screws on both table and knee must be a record - but how much easier it would have been to fit a proper tapered, screw-adjusted, gib "block". The vertical travel of the table was 113/8", the clearance between the spindle nose and table top 155/8" and the throat (from spindle centre to column) 8.5". Supplied as standard with each miller was an electrical reversing switch, collet draw bar, floor cabinet storage shelf, collet storage and chip tray. The overall dimensions were 36 " deep x 40" wide x 70" high. 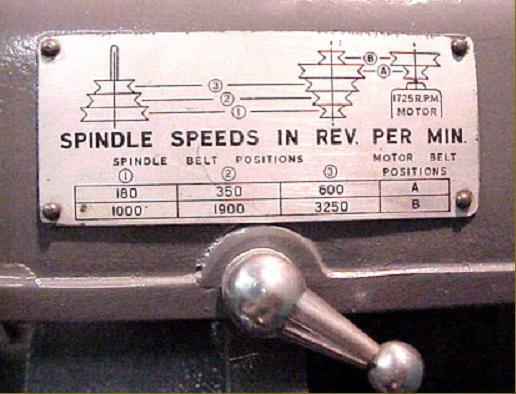 However, despite the advantages outlined, the machine was not without its problems - and there are one or two points worth keeping an eye on: the quill down-feed pinion is rather "light" for heavier work and the gears which operate the fine-down feed are also insubstantial - damage to the last gear in this train is not uncommon. On early machines the quill assembly had no return spring - and hence there was nothing to keep it from dropping if the screw that acted as a friction control was allowed to come loose (this is one miller not to use for very heavy-duty drilling with a 6-foot length of tubing slipped over the feed handle). 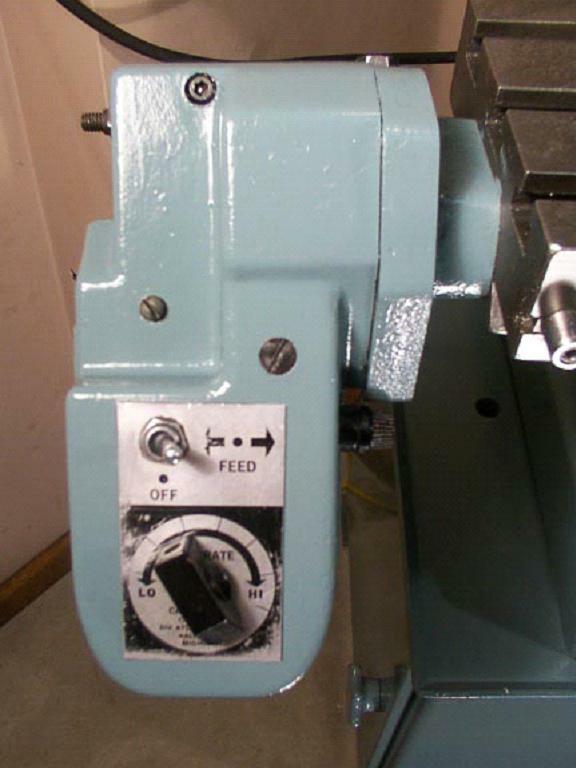 The quill feed could be operated by a quick-action lever with two-rates of feed - either direct or twice as fine. A handwheel was also supplied to assist with more precise positioning of the quill. Clausing Model 8530. 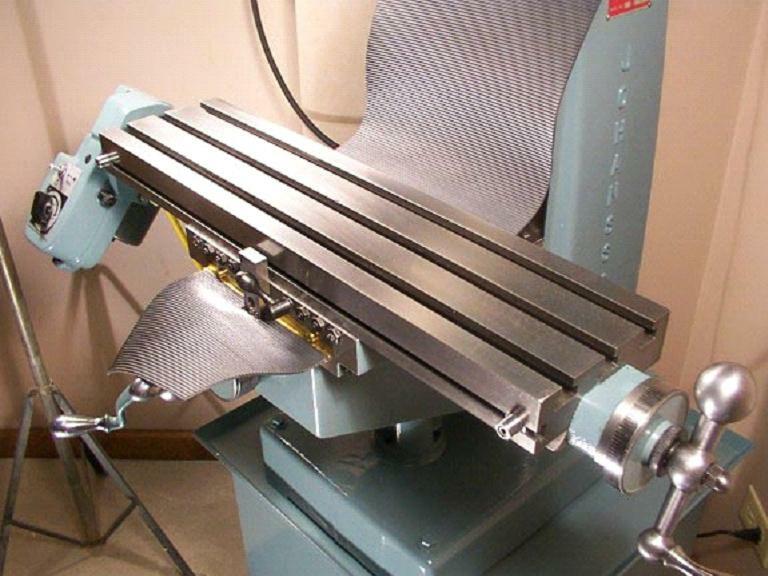 This improved version featured a heavier knee with a horizontal base, a column made taller by the inclusion of a distance piece and a two-speed hand-feed to the table. 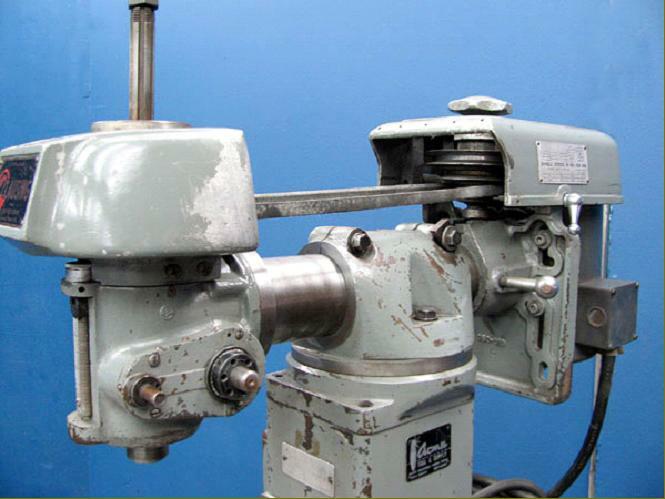 Although considerably improved in some areas when compared to the original machines, the wide spindle-speed range remained unchanged. 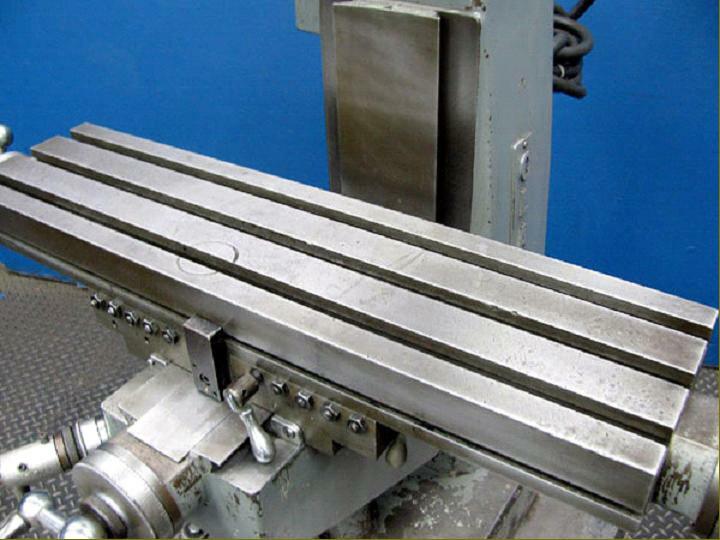 Another option was a variable-speed power-feed unit that could move the table either longitudinally or in traverse. Unfortunately, it earned a reputation for unreliability. 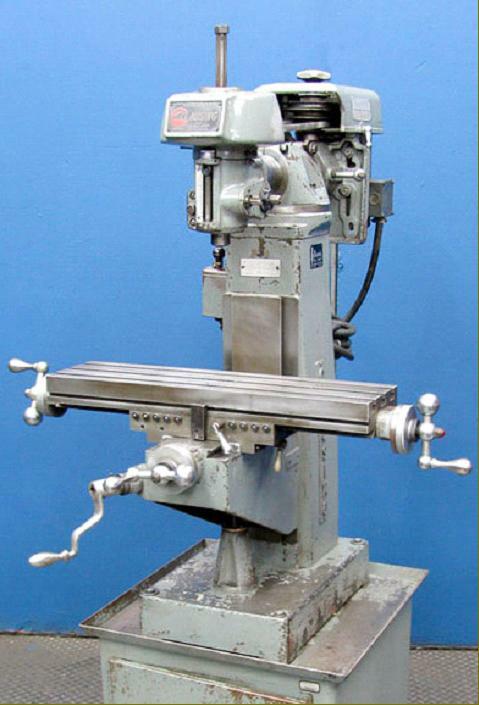 A standard feature of the |Type 8530 was a twin-speed table drive unit. 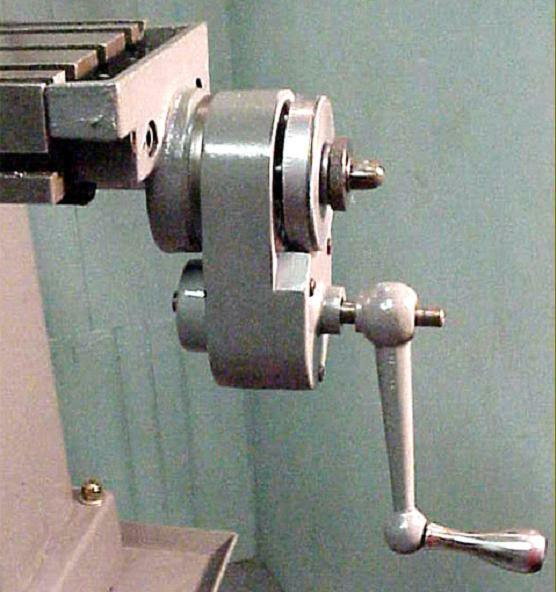 The handle was permanently attached to the lower spindle but could be pushed in and out to engage either direct drive or a "geared-up" mechanism - whereby the table was driven at four times its usual speed. Not a perfect substitute for a power-driven rapid return but a useful feature that either helped the productivity of an operator or relived the tedium of the amateur owner.